MillionTreesNYC (MTNYC) is a public-private partnership between the NYC Department of Parks and Recreation and the New York Restoration Project. Begun in 2007, this PlaNYC initiative is designed to improve the city’s environment and public health by planting one million trees by 2017. Currently a year ahead of schedule, almost 600,000 trees have been planted—23,000 (four percent) of them lining the streets of Brooklyn. Never has New York City seen such an epic investment in greening, and who knows when we’ll see the likes of it again. But a street tree’s life is tough, and Brooklyn tree lovers are wondering: How are all these newly planted trees doing? The short answer: They’re doing well, but they can always use more help. Parks department foresters select tree species that can tolerate tough urban conditions, and they and their contractors use internationally recognized best practices for planting them. Then what? Newly planted MTNYC street trees are under warranty for two years; that means the contractor who planted the tree must water it regularly—and replace any tree that dies—during that time. Once that warranty is up, our urban forest relies on the dedication of hundreds of volunteers who are helping thousands of street trees get established in neighborhoods across the city. Tree mortality rates show that the best odds of new tree survival (over 90 percent) are in residential neighborhoods. That’s likely because caring people can be a street tree’s best friend. According to research published in the journal Cities and the Environment, street trees that exhibit signs of stewardship—their beds watered about 20 gallons per week, weeded, mulched, and cultivated—are four times more likely to survive than trees with no care. So how can you help? Every little bit counts, and acts of stewardship add up. Get involved by attending a free tree care workshop near you to learn the skills needed to properly tend a street tree. Workshop participants who agree to care for a tree receive a free tool kit and TreeLC guide to tree stewardship. Visit milliontreesnyc.org or bbg.org/greenbridge/street_trees for more information. Tree care is contagious; start with just one tree, and soon your whole block may follow! For more information, see BBG’s article Caring for City Street Trees. Download the GreenBridge tip sheet Give Trees a Chance (pdf) to share with your neighbors. Sarah Dougherty is the Brooklyn outreach coordinator for MillionTreesNYC. 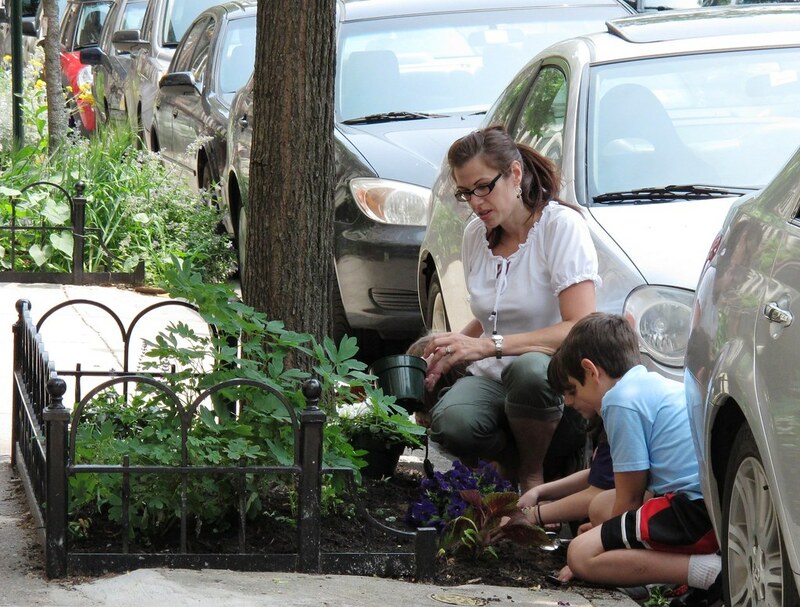 Whether a little or a lot, every act of street tree stewardship counts. Photo by Erik Rosenberg.